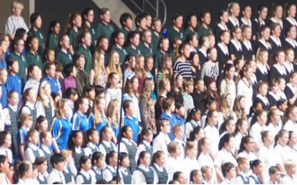 The Ouruhia School Choir is open to all children who love singing. The choir practises once a week before school (8:15 a.m.) on Fridays in the library from the start of Term 2 until early Term 4. We practise songs for the Christchurch Schools Music Festival which will be held this year in the Horncastle Arena from Wednesday 24th to Friday 26th October. As well as massed choirs comprising of up to 20 schools and 500 children, there are representative Junior (Yr 5&6) and Senior (Yr 7&8) Choirs, Orchestra and Concert Band in the Festival. Although Ouruhia choir members of all ages learn these songs, only the Years 5-8 children can perform these at the Festival. Conquest of Paradise by Vangelis (from the movie 1412: Conquest of Paradise directed by Ridley Scott, and also the Crusaders theme song!) Note: Copyright has not yet been obtained; this song may be withdrawn and another substituted. Another favourite song, "Popular", from the hit musical "Wicked"
...and "Defying Gravity" from the same musical.